The investment market for student accommodation is growing up quickly. Due to the growing demand, the Netherlands offers ample investment opportunities. 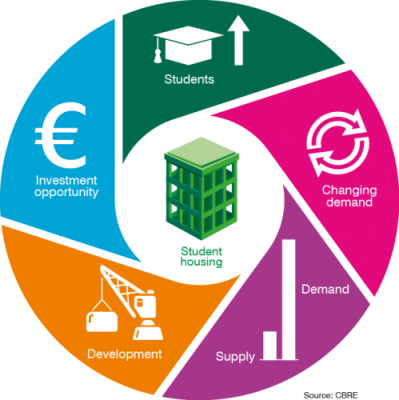 The international real estate advisor CBRE expects that, on top of the current shortage of student accommodation, the demand will rise further as the number of students will grow by 46,700 (6.8%) between now and 2024. At the same time, today's students have different requirements for accommodation. Increasingly, they are looking for a well-equipped, independent studio rather than a room with shared facilities. In short: more privacy and convenience.This has led to a shortage of accommodations of the right size and quality, particularly in the larger student cities. Developers and investors are recognizing more and more opportunities to respond to this. They are building new accommodations and transforming various vacant offices into student housing complexes. Because of the new supply and favourable price level, a growing number of property investors are turning their attention to the Dutch market. They are looking for experienced parties for the management of the accommodation. These are specialist managers from more mature markets such as the UK, but they also include experienced Dutch parties such as Duwo, that enter into partnerships with international investors by means of long-term rental agreements. Financiers are also increasingly aware of student accommodation as an interesting investment product. These are signs that this young market is growing up. 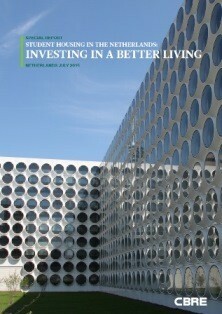 CBRE decided this was a good reason for combining all the ins & outs in the research publication Student housing in the Netherlands: investing in better living.CBRE expects that the investment volume on the student housing market will rise, and that commercial parties will get a bigger share in this. The conditions are favourable and there is a product on the market that responds well to the demand. Moreover, more knowledge is available about this niche, which means investors can make well-founded decisions. To read more open the full report here.